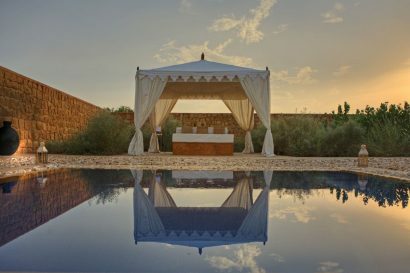 Set on a one hundred acre private estate of indigenous desert scrub, SUJÁN The Serai draws inspiration from the royal caravan sites of Rajputana; blending the dash and vivacity of this Land of Kings. There is no better place from which to venture into the mystical environs of Jaisalmer to discover its fabled golden fortress, a UNESCO World Heritage Site. 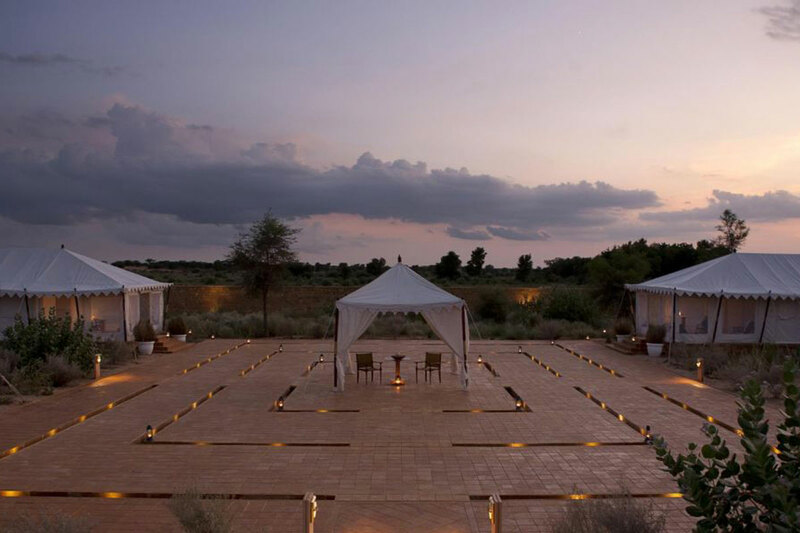 The Serai, Jaisalmer first opened its doors to receive guests in 2008, wedding Jaisal’s passion for the wilderness with Anjali’s fine sense for creativity. As with all SUJÁN locations there is a family connection to the area that has been there long before the project has come to life. Jaisal’s parents Mavika & Tejbir Singh had travelled through the Great Thar desert making documentaries in the 1970’s. Under the aegis of their film production company, the young couple shot a series of documentaries beginning with ‘The City that Jaisal Built’, on the ethereal and until then, relatively unknown desert city of Jaisalmer. The first motion picture to document the city and its life. ‘The Nomads of Rajasthan’ their next feature followed the Manganiars and Kalbelias, traditional bards of Rajputana who sang and led her warriors into battle and betrothal, highlighting their culture, ways of living and ancient songs and dance forms. The songs recorded by Malvika and Tejbir Singh, nearly forty years ago have been revived at The Serai and the ancient folk musicians, who sang for our family when we first came here in 1971, are the same family of musicians who share their music around the campfire today at The Serai. The SUJÁN connection to Jaisalmer is one of friendship, of personal connections, of a family being drawn to a destination decades ago, that is favoured by many today. In its first year, The Serai was an early Indian property to become a member of Relais & Châteaux. Many of the experiences shared at The Serai would not have been possible without the collaboration of local communities. Our guide on that first journey many decades ago, continues to walk our guests through the history and legacies of Jaisalmer today! 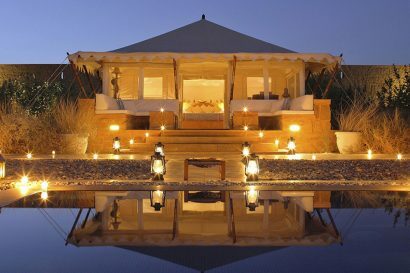 The Serai is an oasis, a place for complete rest and rejuvenation in the desert surrounds, spacious, peaceful and luxurious. 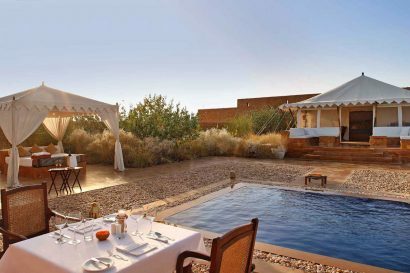 Relais & Châteaux properties across the world are unique and outstanding, reflecting the place, its people and their cultures. The Serai serves sumptuous local delicacies as well as delicious western repasts drawn from inherited recipes that pattern the daily changing menus, meticulously planned, to give you eclectic fare using fresh homegrown organic ingredients from our farm and gardens. 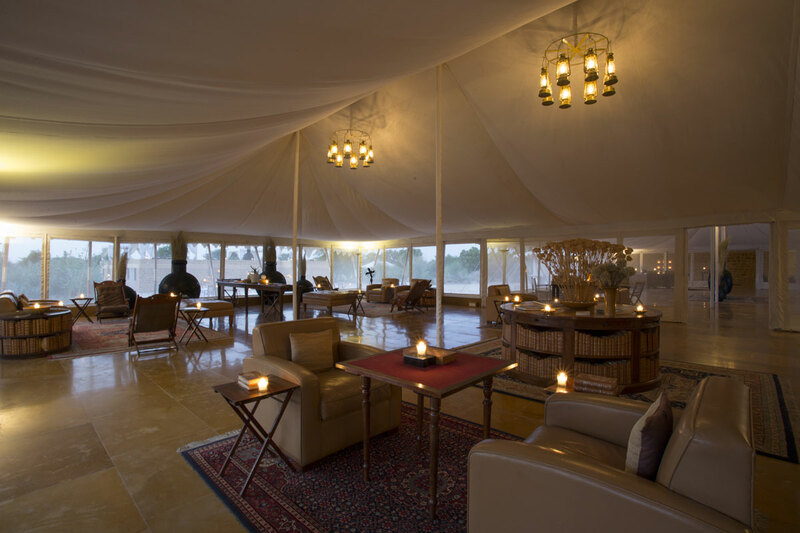 You may choose to dine at the dining tent or anywhere on site, and we are always on hand to create an experience tailor–made to suit your particular desire, or mood. 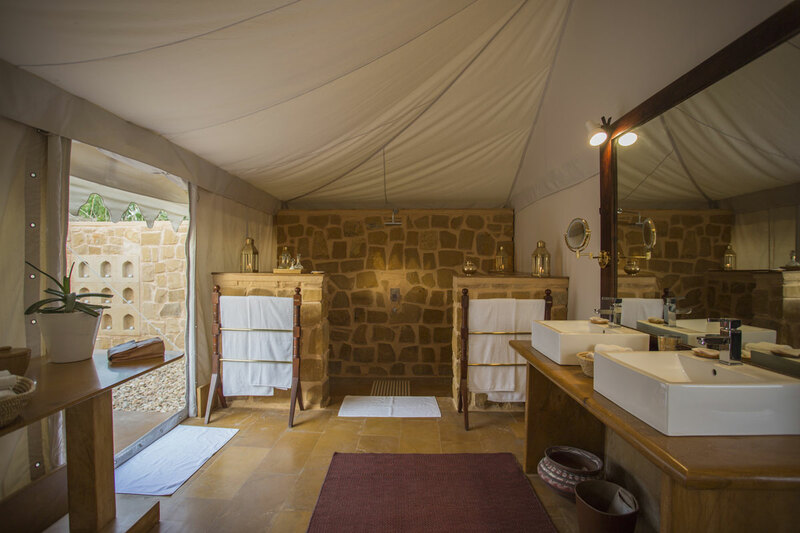 The SUJÁN Spa comprises four tents with interiors that induce soporific charm and a sense of well–being set within a walled garden. A diverse menu of therapies ensures you experience the mood and essence that your mind and body demands. From rousing reflexology to cleansing scrubs and relaxing massages, the organic and ayurvedic products we use are made with ingredients from the Thar, blended with an array of healing herbs that leave you feeling relaxed and heavenly. 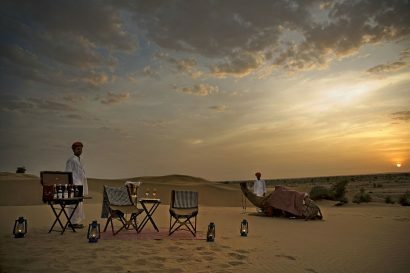 Bherwa District – Jaisalmer – however no neighbourhood as it is a wilderness property in a remote location. 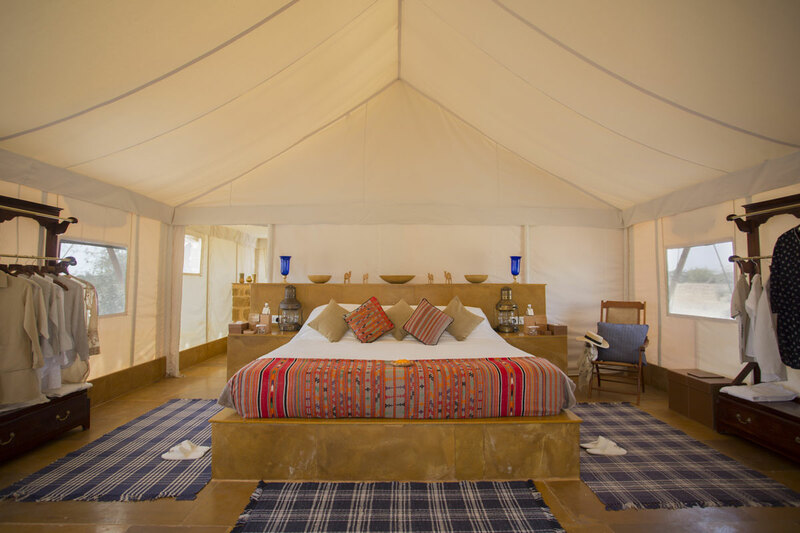 The camp is perfectly located for excursions to the fabled, twelfth–century desert kingdom of Jaisalmer. 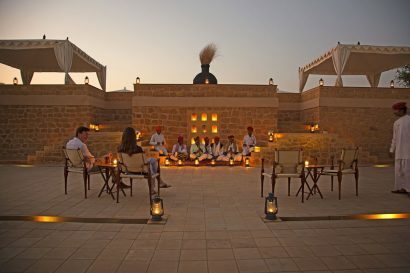 Jaisalmer is of course famous for its UNESCO World Heritage Site the ‘Golden Fortress’ which you can explore on your walk through the ancient fortress city, marvelling at the intricately carved Jain temples and private havelis or mansions. 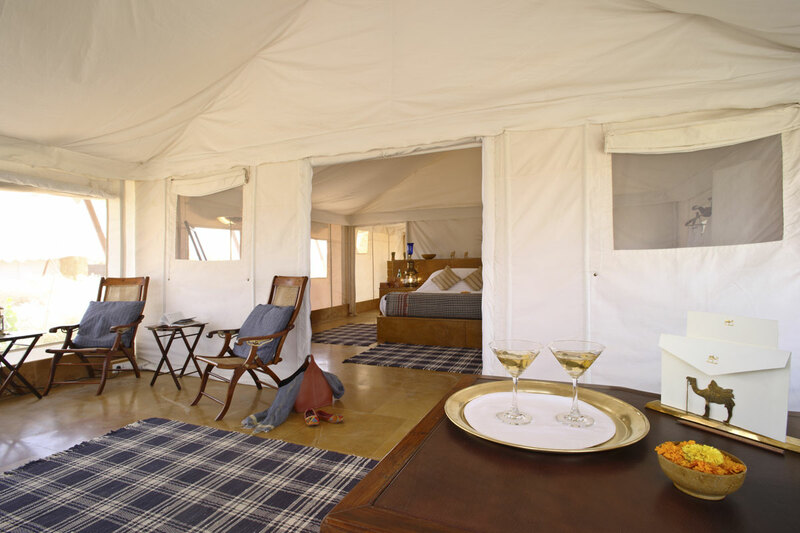 Camel safaris, bird walks, desert drives and sundowners on the sand dunes are just some of the other memorable and sought after escapades we offer. Each of our tailor–made excursions is led by an experienced guide and can be booked in advance, which is preferable, or else on arrival at the camp, which will be subject to availability. Lots of fun acitivites for kids and a play area for arts and crafts. There isArchery, pottery, painting, wildlifewalks, nature trails, kite flying and the verypopularvisits to the farm and dairy to feed the cows and chickens and pick their own fresh vegetables from the kitchen gardens. All ages welcome. Six Luxury Tented Suites are on offer, each with their own private, open to the sky, plunge pool. Your blue ceramic tiled pool will be heated on request, and is gently lit by candle light at night, perfect for a special romantic interlude. The Serai serves sumptuous local delicacies as well as delicious western repasts drawn from inherited recipes that pattern the daily changing menus, meticulously planned, to give you eclectic fare using fresh homegrown organic ingredients. You may choose to dine at the dining tent or anywhere on site, and we are always on hand to create an experience tailor–made to suit your particular desire, or mood. Freshly produced salads and ingredients from The Serai’s Organic Herb and Vegetable Garden are used to create delicious, sumptuous meals. The Serai’s legendary dining experience. Bush cooking involves the most rustic form of cuisine, showcased by our team using traditional Indian methods of cooking, be it on the fire or under the ground on hot coals. The menu’s are a la carte. 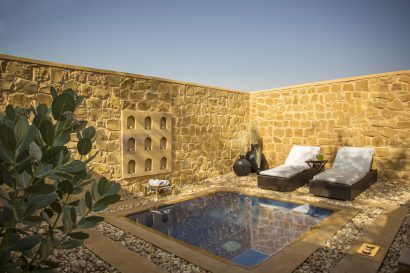 Local craftsman worked the stone, built grand plunge pools, and a towering inverted step well upon which lies the placid main infinity pool. Outdoor fitness and wellness classes are available, yoga, meditation, running, walking. There are no gym facilties. The globally acclaimed SUJÁN properties are private, and exclusive hotels, renowned for creating new benchmarks in luxury and service. The SUJÁN experience is crafted to appeal to the connoisseur, the adventurous and those looking for the extraordinary. Defined by our highly personal and creative approach, we are capable of producing high–end events ranging from marriages to family celebrations, private parties to corporate meetings, and brand launches. SUJÁN luxury’s award–winning properties are enchanting, elegantly designed and provide breathtaking venues for all occasions. The Serai is an ideal, secluded desert getaway to celebrate something private and special. Over the years we have hosted many amazing parties here, including a private New Year’s Eve celebration with over 100 musicians from surrounding villages performing well into the night. The SUJÁN in–house event team works closely with our clients and guests to conjure up unforgettable memories, providing an experience like no other! 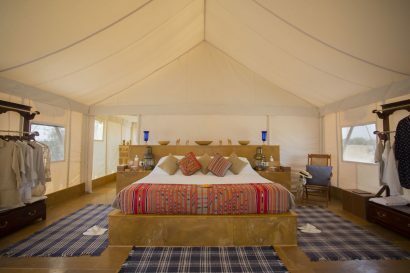 For large events we require the entire camp/palace to be booked out.